End of initialization. Time=       0.384 Sec. I= 1 L=       0        Time=       1.208 Sec. I= 2 L=       0        Time=       1.384 Sec. I= 3 L=       1        Time=       1.380 Sec. I= 4 L=       2        Time=       1.388 Sec. I= 5 L=       5        Time=       1.384 Sec. I= 6 L=      10        Time=       1.384 Sec. I= 7 L=      21        Time=       1.384 Sec. I= 8 L=      43        Time=       1.380 Sec. I= 9 L=      87        Time=       1.384 Sec. I=10 L=     174        Time=       1.384 Sec. I=11 L=     349        Time=       1.380 Sec. I=12 L=     698        Time=       1.384 Sec. I=13 L=    1396        Time=       1.380 Sec. I=14 L=    2794        Time=       1.380 Sec. I=15 L=    5588        Time=       1.380 Sec. I=16 L=   11176        Time=       1.368 Sec. I=17 L=   22353        Time=       1.352 Sec. I=18 L=   44707        Time=       1.316 Sec. I=19 L=   89415        Time=       1.228 Sec. End of calculation. Time=      27.306 Sec. End of data output. Time=       0.132 Sec. 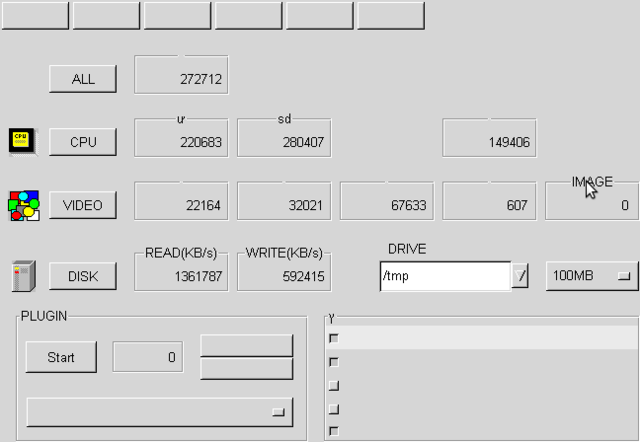 Total calculation(I/O) time=      27.438(       0.716) Sec. Measure the performance in 3 times. Now, start the actual measurement process. This will take about one minute.